^ Kwame Anthony Appiah; Henry Louis Gates, Jr (1999-10-27). Africana: The Encyclopedia of the African and African American Experience. Civitas Books. p. 2045. ISBN 9780465000715. ハロルド・イングラムズ (1967-10-13). Zanzibar: Its History and Its People. Psychology Press. ISBN 9780714611020. Michler, Ian (2007-10). Zanzibar. The Insider's Guide. Struik Publishers. ISBN 9781770074606. 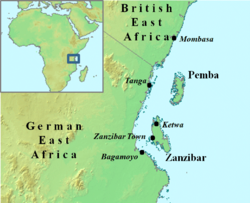 "Zanzibar, a sultanate and British protectorate of East Africa". Encyclopædia Britannica (11th ed.). 1911.